Bought this for my guest bedroom/craft room because we have guests arriving on Christmas Day and wanted them to have a little Christmas Cheer in their private space. But it's so cute and the perfect size for a guest/child's room or even an office, that it's going back in there every year! Love the ease of storage also! My husband and I will be looking at one of the larger trees as we are getting older and it's getting harder and harder to drag out a regular tree and decorate it fully! Since I don't have room for a full size tree, this is perfect for my end table in the living room. 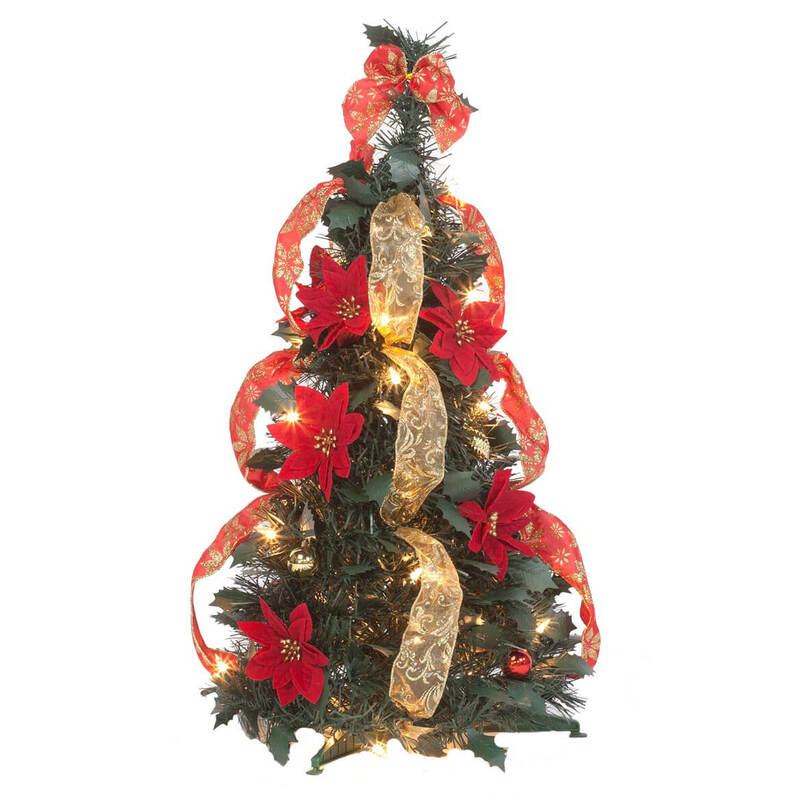 I need some decorations that are 2 to 4 foot tall for a few area's in my house that I noticed needed some lights. Love these collapsible trees. It's for my sister, she is moving this month and won't have a Christmas Tree. I have small space and I wanted a tree! Wanted for an office and was just the perfect size - very pretty!! This is beautiful always wanted a pull up decorated Christmas Tree and afterwards it collapses and can be put away for next time. This will look nice in apartment waiting to receive it. Merry Christmas to all! It will look pretty in my window! I chose this ease of it ease of storage ad its size. It is for my guest bedroom/craft room and is the perfect size for that room! It is ey pretty and my guests enjoyed having their own little tree over the Christmas week! I need a new tree, but I can't have a large one. I live in a senior living apartment and I saw this kind and thought it would be nice to pack it away and not damage it. Good reviews on other sizes of the same type of tree and convenience. 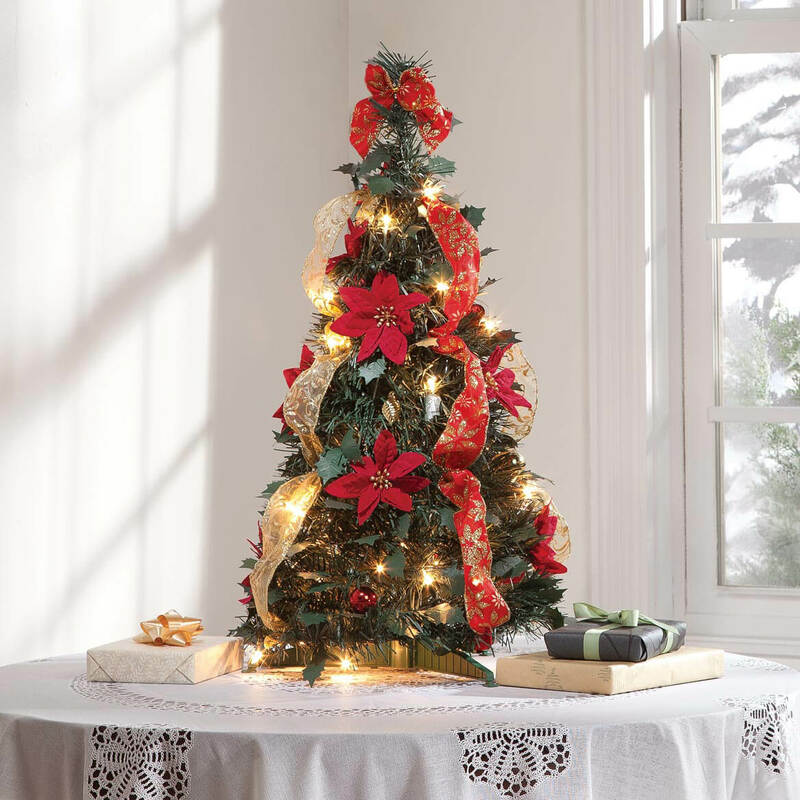 The small, already lit and decorated Christmas Tree is ideal for the limited space available for display, not to mention what an excellent price. In addition, it will store easily. Am a 80-year old widow w/no living family. Xmas is lonely for me, Thought this tree might give me some joy. Also it is affordable. My budget is so limited , have little or no extra for non-essentials. A thanks to MMK for offering this opportunity. Getting too old to put up my original tree. I am trying this as a convenience. a pull up tree sounded easy. I have a similar 4 foot tree and I love it. And I am giving the 2 foot tree to a man in a nursing home. This comes with the stand? Thank you. I have 5 of the 5 foot trees so was confused by the one review that said they would have to go get a stand, so, I wanted some clarification. Yes. The stand is attached to the bottom of the tree. There's a two-piece rod that goes up through the center of the tree and sticks into the stand to keep the tree standing up. Thank you for your question. 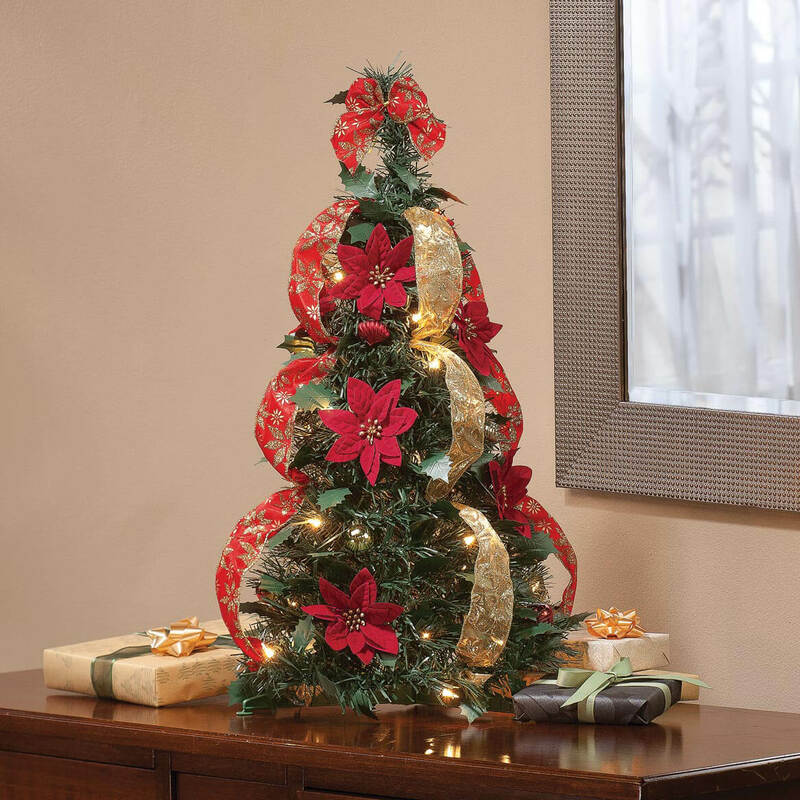 A stand is included with the tree. We hope this information will be of help to you. Yes! It is perfect for my purposes. I intend to find a box I can just drop it in for next year. Yes. I am perfectly happy with the tree. BEST ANSWER: It is very, very easy to set up, so much so that I'm considering one of the bigger ones for when we are too old to drag out and decorate a big tree!! Very pretT.y and you could even Aggie some of your own (very small) ornaments to it! I highly recommend this for a children's room, guest room or even a hospital room or a rehab home! Yes I set it up this morning and it really looks cute I put it on a End Table and it is perfect for this area. Instructions are easy and I had it set up in 15 minutes hope this helps and have a Merry Christmas! Very easy. I bought it for it's size and looks for a person in an Assisted Living Home. Haven't set it up yet. BEST ANSWER: Thank you for your question. The tree is made in China. We hope this information will be of help to you.